Today I mourn the death of a feral cat whose only crime in life was to be born outside the protection of a loving home. He was killed* by a staff of two whose duty to the County was to do just that. They are good people and they have to depersonalize such actions to perform their duty and fulfill their job description. They view feral cats as mean and dangerous, rather than frightened out of their wits by their archenemy, man. This I understand for it is the only way they can do their job. Like all of you, I honor the life of every animal that enters a shelter. Since I am permitted to enter the isolation room to work with cats that may be ill, injured, or questionably feral, I come in contact with the death row kitties. Thanks to a Barn Cat Program I helped to develop, most feral cats survive. When I enter the isolation room I talk very softly to the feral kitties and sneak them a special treat of wet food. Some hiss at me before moving forward to claim their prize. Some wait till I leave the room to feel safe enough to come forward. Over the years of working with these beautiful wild animals, more often than not, after settling in, they look forward to me entering the room. They come forward for their treat before it is offered and I feel rewarded. Yesterday, when I arrived at the shelter, I was told that the mean feral cat was in the freezer. 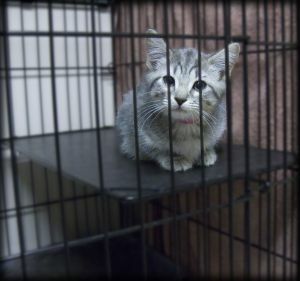 The employee said the feral had put up a good fight, as they tried to remove him from his cage, and that they had to chase him down, for he had escaped into the room. I took a deep breath and headed for the isolation room where I found the stack cages empty except for scattered litter, food, water, and feces. The floor was scattered with the same, and urine soaked litter stuck to the walls. He had put up quite a fight. The stench was so great I opened windows wide and I still cannot shake that smell. I then put on rubber gloves and got a towel for the only remaining tenant of the isolation room. I wrapped the tiny starved kitten in the towel and we headed out back to a bench where we could breathe fresh air. I can just imagine what it must have been for that poor frightened kitten as his roommate was chased down and destroyed. I tried to comfort him as he comforted me. As I write this letter I ask myself what else I could have done to save that poor frightened animal. All that I can think of is that we attempt to save these beautiful wild cats by getting them fixed and into barns and feral colonies. I feel that I have failed this poor creature and cost him his life. Please help me to find a way to stop the killing. *Editor’s Note: Like the author, FIV Cat Rescue does not dance around the word kill. For some shelters and vets to use euthanize in conjunction with the killing of feral cats or kittens and cats that test positive for FIV antibodies is a misnomer.